Composting at home is relatively easy, even for those who may be unfamiliar with the process. All it takes is a little time, effort and patience. Composting organic materials such as yard trimmings and food scraps reduces the amount of waste that ends up in landfills or combustion facilities. Adding compost to the soil provides valuable nutrients, improves soil structure, adds beneficial soil micro-organisms and attracts earthworms, suppresses certain plant diseases, reduces the need for fertilizers and pesticides, and helps prevent soil erosion and nutrient run-off. Composting, like recycling, is an easy way to ensure a sustainable future while also giving your plants a boost! You can compost in your backyard and in your home! Outdoor composting is as easy as building a compost pile or a bin and adding the right mix of ingredients. Although slightly more challenging, indoor composting is a great alternative for those who live in an urban area or an apartment. Compost piles and bins come in many different shapes and sizes. There is no right one to make or buy, although some have advantages that will suit your specific needs. For instance, a family of six or more might use a three-bin system for their larger volume of waste, while a smaller household may choose to use one or two bins. While a gardener wanting compost fast may choose a rotating drum. 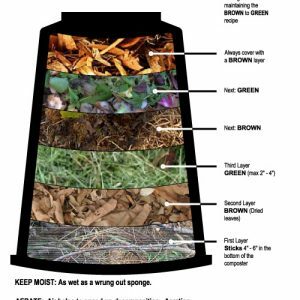 For a comprehensive list of compost bins, complete with pictures, their pros and cons, and instructions on how to build them, read Cornell University’s Waste Management Institute guidance document on “Bin Designs.” (see attachment at bottom of this page). You can make a compost bin or a compost pile on your own, but if you’d rather buy a bin there are many kinds of options available. Check out your local hardware store or do some research on-line! Through indoor vermicomposting worms, usually Red Wigglers, break down organic material. This kind of composting works well in urban environments or apartments. As the worms tunnel through the composting material, they create air channels allowing the air to get into the center of the bin. Red wigglers are attracted to food odors and eat the degrading food and microorganisms, which reduces potential odors coming from the bin. Food – A good working compost pile has a mixture of high nitrogen, moist materials called “greens” and drier, carbon-rich materials called “browns”. Greens include food scraps (such as fruit and vegetable peels, coffee grounds, tea bags and old bread), fresh grass clippings, fresh weeds and manure. Browns include fallen leaves, dry weeds, shredded paper, wood chips and straw. Add greens and browns in layers. Every time you add food scraps, cover them with browns or with partially degraded materials to deter unwanted creatures from your compost pile or bin. 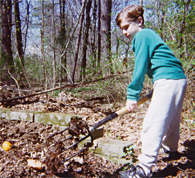 Microorganisms – Bacteria and fungi do most of the work in a compost pile. They eat the food and turn it into compost. Having enough food, air and moisture will help the microorganisms to thrive. Air – Compost microorganisms need oxygen! While not necessary, turning (or mixing) the pile twice a month will add more air and speed up breakdown. What Can’t I Compost at Home? NO meat, fish, poultry, bones, or fatty foods such as cheese and oils. These attract animals and do not compost well in a home system. If you are managing your food scraps in your backyard composting bin, you are not required to place meat and bones in it if you so choose. Those items can be placed in your trash. Gardens and Lawns- Mix it into the garden soil or sprinkle it on the lawn to improve moisture retention and soil texture and add beneficial microorganisms and nutrients. Landscaping – Use it around garden beds, trees or shrubs as a mulch. House Plants – Use 1/2 to 1/3 of your container volume instead of soil. Even better than composting grass clippings and leaves, mulch/mow them into the lawn. This can save homeowners time and can improve lawn health. 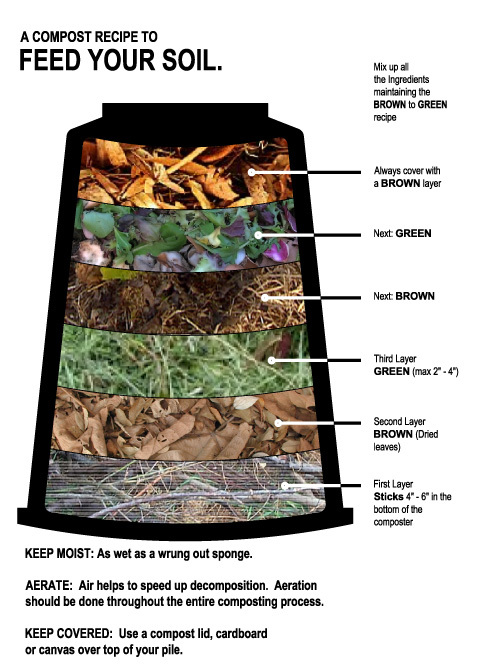 Below are some guidance documents on backyard composting.